Major League Baseball Commissioner Rob Manfred has been consistent in his support of a worldwide draft, speaking openly about his — and the owners’ —desire for such a system once the collective bargaining agreement expires in 2016. During a recent visit to the Arizona Diamondbacks’ spring camp, Manfred said of the international draft: "It makes all the sense in the world to have a single method of entry." 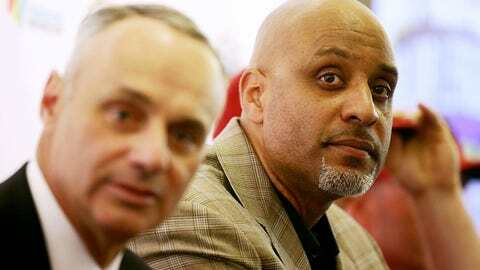 However, MLB Players Association executive director Tony Clark — Manfred’s counterpart at the bargaining table — is not ready to endorse an overhaul of the sport’s amateur talent market. "The idea of a worldwide anything or an international anything in a lot of ways sounds great in theory," Clark said after a visit to the Cleveland Indians’ spring complex here. "But fundamentally, there are a tremendous amount of challenges based on what is already part of the system and/or what is not part of any individual system in any individual country — with respect to how those players are being developed, with respect to how those players are being educated, against the backdrop of when they’re being asked to make decisions about their professional careers. "Here in the States, we have a process and protocol in place that allows players to develop and grow and be in school and be educated — and make educated decisions at 18 or 21 or 22, when they come out of college. To simply take a system that appears to work — and I say ‘appears’ purposely — appears to work in one place and plop it down in another is a dangerous proposition. "Again, in theory, I can appreciate how easy it may sound to have everyone enter our game the same way. But the challenges that exist are far greater than most are giving credit for." The issue of equitable entry to MLB became particularly relevant in recent days, following Yoan Moncada’s amateur record signing bonus of $31.5 million with the Boston Red Sox. Afterward, Tampa Bay Rays left-hander Drew Smyly tweeted that it’s "not right" for a 19-year-old Cuban to receive that sum when the best 19-year-old in the US would get probably "1/6th of that." "Everyone should have to go through same process," Smyly tweeted. When asked about Smyly’s comments, Clark said: "Our players have the ability to speak their minds whenever they decide to speak their minds. … I love Drew. Drew’s a great kid. At the end of the day, he voiced his opinion, which I think is fantastic. I encourage guys to voice their opinion. And as we move forward, we as a group will continue to talk about any number of considerations. An international or worldwide draft is going to be one of those topics of discussion. I will be very interested to hear Drew’s thoughts, as well as any other player’s."